The Ohio Constitution guarantees Ohioans’ right to propose (“initiate”) amendments to city and village charters. If Toledo’s voters approve the Bill of Rights, it may – not next month, maybe not this year, but sooner, not later – protect Lake Erie, Ohio’s greatest single natural resource. That’s good, because the General Assembly, corporate agriculture’s best friend, won’t. 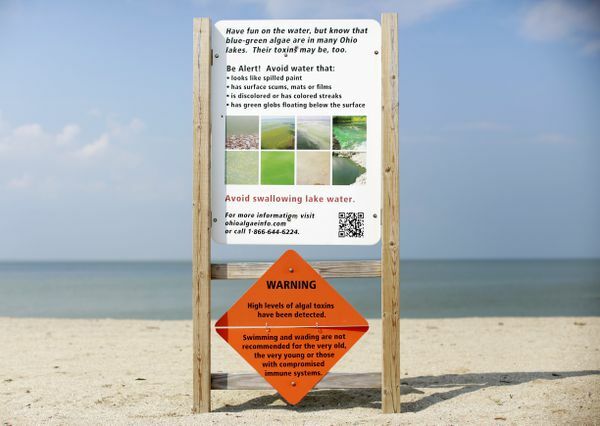 This Tuesday, Sept. 1, 2015 photo, shows a warning sign for high levels of algal toxins along the beach of Maumee Bay State Park in Oregon, Ohio, near Toledo. Algae blooms in Lake Erie, fed by agriculture runoff and overflowing sewer pipes, have become so toxic that they shut down Toledo’s water system for more than two days in the summer of 2014. On Feb. 26, Toledoans will be able to vote on a proposed Lake Erie Bill of Rights after an Ohio Supreme Court ruling this week cleared the way for the referendum in a special election.